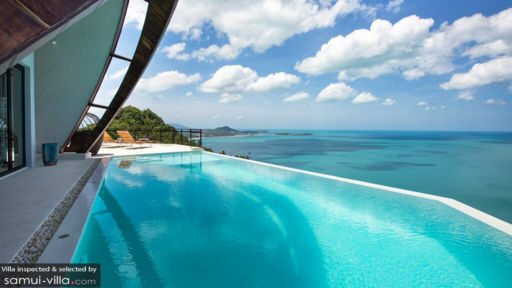 Chaweng Peak Villas are two vacation residences – one, terraced, and the other, a cluster of domed pavilions – both embodying innovative architecture and plush, contemporary design. Glassy interiors are appointed with mostly stylishly crafted furnishings, fixtures and pieces. At once, amenities are deliberately first rate – to assure each and every guest’s absolute convenience and diversion. Built on a hillside above Chaweng Noi, Chaweng Peak Villas, truly, accord you highland vacation living with an air of sophistication. Both houses have a total of eight air-conditioned bedrooms – four in each residence. In the terraced, lower house, one bedroom has a king-sized bed, another has a queen-sized bed and two others have twin beds. In the domed, upper house, all bedrooms have king-sized beds. All bedrooms have dedicated bathrooms with rain showers and bathtubs. Most of these bedrooms open out to furnished balconies with breathtaking ocean views. A few of these bedrooms have direct access to the infinity pools. 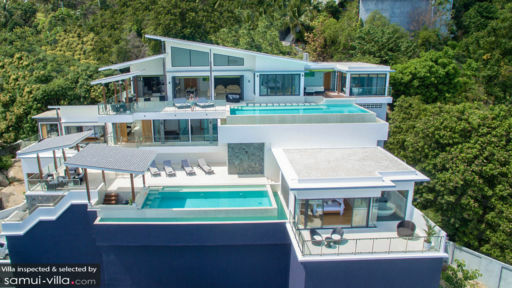 All in the all, both residences have three infinity pools – the lower house has two, and the upper house has one. Dip into their alluring, crystal clear waters which appears to carry you out to sea. If you wish to bathe, instead, in the sun, you can laze on cushioned, woven wood or ergonomic pool beds on scenic stone decks. The swimming pool on the ground terrace of the lower house also has a swim-up bar where you can enjoy cool, fruity drinks. Combined, there are three living areas – the lower house has both indoor and alfresco at the topmost terrace common area, and the upper house has one in the central domed pavilion – with hefty, long and angled, as well as cushioned, woven wood couches. At any of these living areas, you can all assemble for amusing and animated sharing and storytelling. There are also three dining areas – the lower house has both indoor and alfresco also at the topmost terrace common area, and the upper house also has one in another domed pavilion. At any of these dining areas, you can all feast on authentic Thai cuisine – as well as your most requested comfort food – concocted by in-house chefs at fully-equipped, ultra-modern kitchens. Each residence also has a billiards room and a TV lounge where you can catch shows you’ve been closely following, watch – for the nth instance – your all-time, favorite classic film, or compete for a few bragging rights. Both residences, however, share a gym where you can do your regular exercises, as well as a spa where you can ease aching muscles with a traditional Thai massage and other pampering treatments. Assigned to attend to the villas’ daily services is a staff headed by a manager backed by a concierge as well as by chefs, housekeepers and security personnel. In addition to the chefs, drivers and spa therapists may, upon your request, be called in. However, their services will be charged separately. Car rental is also available. As the villas’ name indicates, Chaweng Peak Villas are based in Chaweng. Just five minutes by car from these villas is Chaweng Beach where you can spend the day swimming and combing its powdery, white sand coastline. Offshore is Aquapark Samui where you can take on its challenging – yet fun – inflatable obstacle courses. On another day out, try out a new sport – Football Golf – at the Samui Football Golf Club. Then catch action-packed Muay Thai bouts at the Petchbuncha Boxing Stadium. On your next day tour, go see a replica of Buddha’s footprint at Wat Khao Hua Jook. Then hunt for bargain finds, souvenirs and presents at the Central Festival Samui. After dark, dance the night away at the iconic Soi Green Mango.